GOP Pressured To End 'Tea Party Racism' : Tell Me More A Latino advocacy group has launched an online campaign pressuring top Republican leaders to apologize for "inciting Tea Party racism." A Latino advocacy group has launched an online campaign pressuring top Republican leaders to apologize for "inciting Tea Party racism." The group Cuentame (Spanish for "tell me") posted a video and petition late Wednesday to its Facebook page in response to ongoing reports that members of the conservative Tea Party movement formed a mob around members of Congress on Saturday in protest of their vote to overhaul health care. 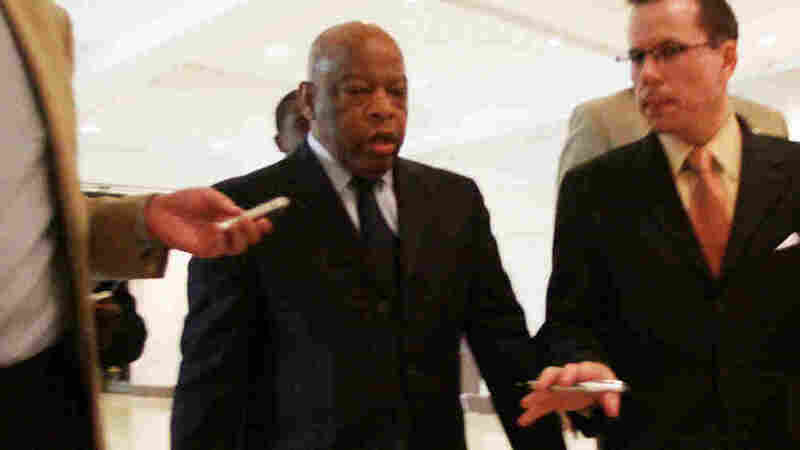 Venerable civil rights leader, Rep. John Lewis, a Democrat from Georgia, along with fellow African-American Congressman Andre Carson, a Democrat from Indiana, say they were both called n***er as they returned from hearing President Barack Obama address Congress at the Capitol. In the video and petition, Rep. Emanuel Cleaver, an African-American Democrat from Missouri, is seen confronting a demonstrator after being spat upon. (Although detained by U.S. Capitol Police, the individual was later released after Cleaver declined to press charges.) The footage also captures openly gay Rep. Barney Frank, a Democrat from Massachusetts, being called a fa**ot. House Majority Whip James Clyburn, who is an African-American Democrat representing South Carolina, spoke with NPR's Tell Me More Thursday and likened any attacks against congressional members for their vote on health care legislation to intimidation tactics employed by terrorists. "I sat in. I kneeled in. I marched [in the 1960s during the Civil Rights Movement]," said Clyburn. "I'm the hardest person in the world to intimidate." As previously discussed on Tell Me More, Tea Party activists have gone to great lengths to demonstrate their anger over what they decry as an over-saturation of government interference and excessive spending by the Obama administration and Congress. In February, the group even held a national convention — headlined by former Republican vice presidential candidate Sarah Palin — to reaffirm its outrage and commitment to letting the world know about it. The group describes as its core values the promotion of "fiscal responsibility, constitutionally limited government and free markets," according to its Web site. But the $940-billion health care legislation recently signed into law and recently forced back to the House for another vote doesn't live up to those values, members of the movement say. The Cuentame Facebook video and corresponding petition is perhaps a culmination of what more than just a few say is another core value of the Tea Party movement: racism. The racist label has followed the group — whether wanted or not — long before its recent, loud opposition to health care legislation. In April 2009, blogger Jill Tubman penned this post exploring how many believe Tea Party members blur the lines of free speech and racist or hateful rhetoric directed at the U.S. government (which just happens to have a black man at the helm). Joseph Farah, who runs the conservative news Web site WorldNet Daily, spoke at the February Tea Party convention in Nashville and sees little wrong with the group's demonstrations. "When you're in a position to impose solutions upon people, especially as legislators are, you'd better expect anger," says Farah, who also spoke with Tell Me More on Thursday. Still, he says, the actions of a few are being blown out of proportion. "Individuals are responsible for individual behavior," he says. "When one person steps out of the crowd and shouts something inappropriate or misbehaves, it's that person who is responsible [not the entire group of Tea Party demonstrators]." Although Republican members of Congress participated in the recent demonstrations, Republican Party Chairman Michael Steele (who also just happens to be a black man) says Republicans shouldn't be blamed for the antics of the protestors. "It's certainly not a reflection of the movement or the Republican Party when you have idiots out there saying stupid things," Steele recently commented on NBC's "Meet The Press." Whether it should be a reflection of the GOP is up for debate. But, arguably, it just is. Hence, the petition to Republicans to either do something about unruly partiers or uninvite them to the party. Separately, the growing amount of attention being paid to Saturday's Tea Party demonstrations, namely the spitting and hurling of racist epithets, has caused some uneasiness among group patriots upset about the wayward behavior of some of its members. Unfortunately, the actions of a few diminish us all. And worse, the liberal media attibutes [sic] these actions to all who band ourselves together as true Patriots. There is a right way to express our anger and effect change and there are those who are wrong. I repudiate any that engage in such activities. All true Patriots should follow suit. Whether the "patriots" embrace Heikkinen's call to action is one thing; whether Republicans embrace their association and deal with it is another.